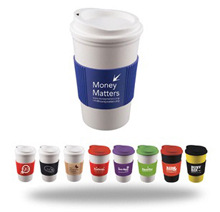 Use a batch of Walk-around Coffee Cup with Logo and lid to gain some valuable advertising and you won't believe the results on your profit margin. Personalise these promotional americano mugs before handing them out. With a wide range of colour choices, you can match your Company branding theme and colours with this double insulated coffee mug for perfection! For a FREE QUOTE, please fill in the form regarding our Walk-around Coffee Cup with Logo and lid and we'll be able to help you.